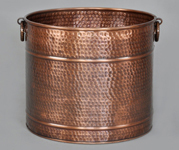 Umbrella stand in solid copper for the serious copper collector or for everyday use. Height 19" (overall). Diameter 8.5" (measured across top opening). Diameter of base 10.75." 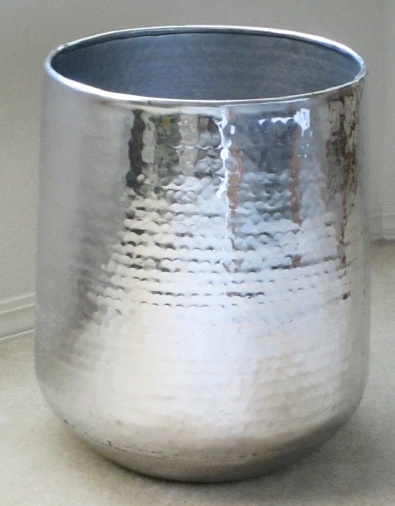 This rugged umbrella stand features a gently hammered antique finish that is lacquered to resist tarnishing. Expanded base rim for added stability. 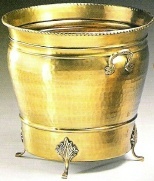 This elegant piece is heavy guage solid copper designed for residential or commercial applications. 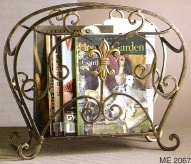 Cast brass "rope" ring handles and cast fittings are antique copper finish. Made especially for Excellent Accents Inc. [Note: Dimensions, weight, or final finish patina may vary slightly as this item is hand made).